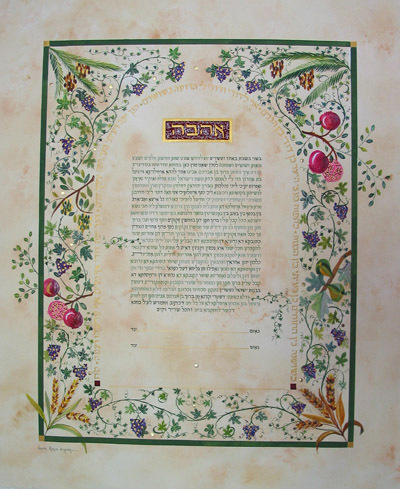 This Orthodox Ketubah text is written with three shades of green and complements the green frame with four Gold Leaf corners. The inner arch is created with Hebrew verses from "Song of Songs" is written in gold paint. The arch symbolizes an entrance, a beginning of a happy journey into life together. The illumination is created with the Seven Species with which the Land of Israel is blessed, and small Gold Leaf dots as accents. In the Gold box with red background we have the Hebrew word AHAVAH (Love). Size: about 20" X 26"